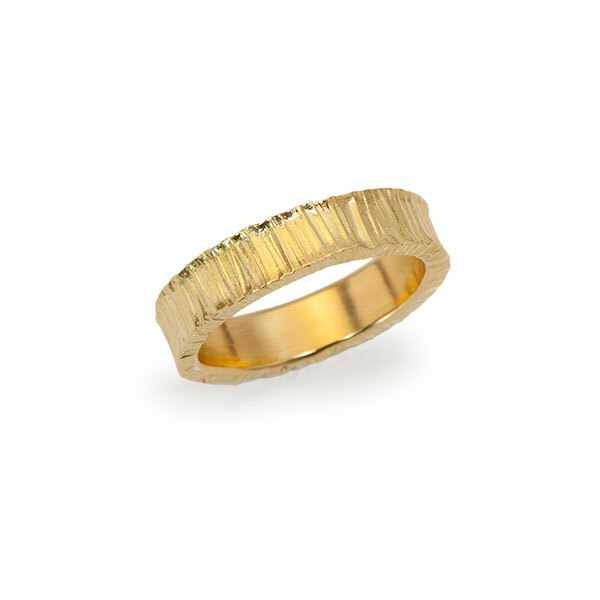 Ring is in forged 18kt yellow gold with Diamonds (.46tcw) set around the edge in 22kt yellow gold granules. 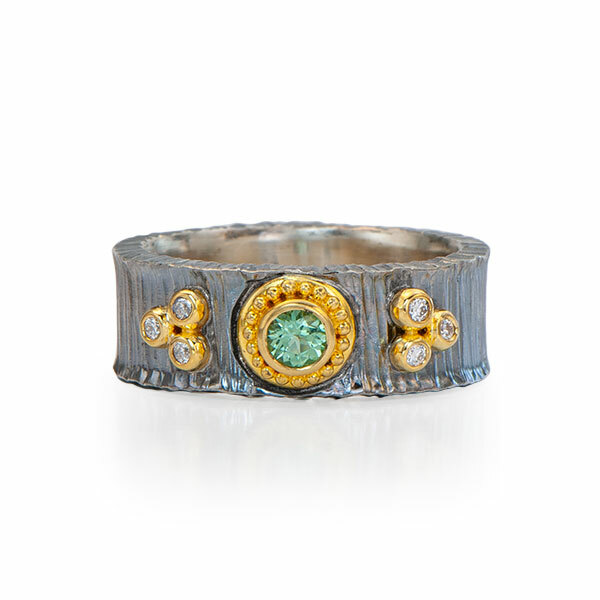 Ring is set with a Mint Green Tourmaline (.19cts) and accented with Diamonds (.09tcw) in granulated 22kt yellow gold on a forged and oxidized sterling silver band, 8mm wide. Ring is set with a Pink Sapphire (.19cts) and accented with Rubies (.12tcw) in granulated 22kt yellow gold on a forged and oxidized sterling silver band, 8mm wide. 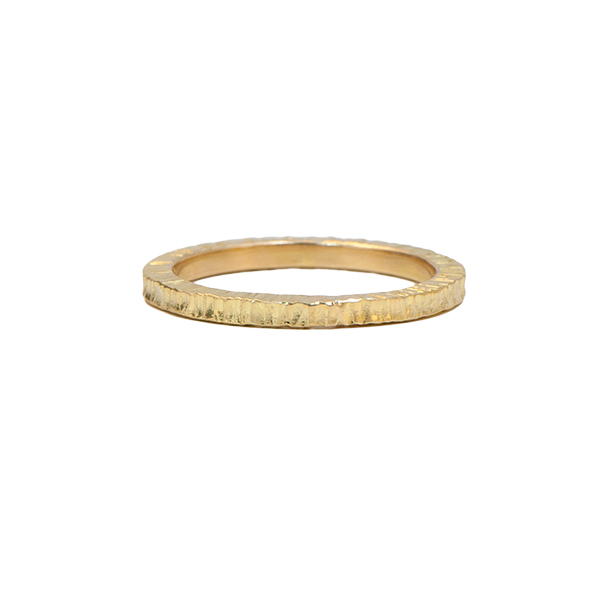 Forged 18kt yellow gold band, 5mm wide. 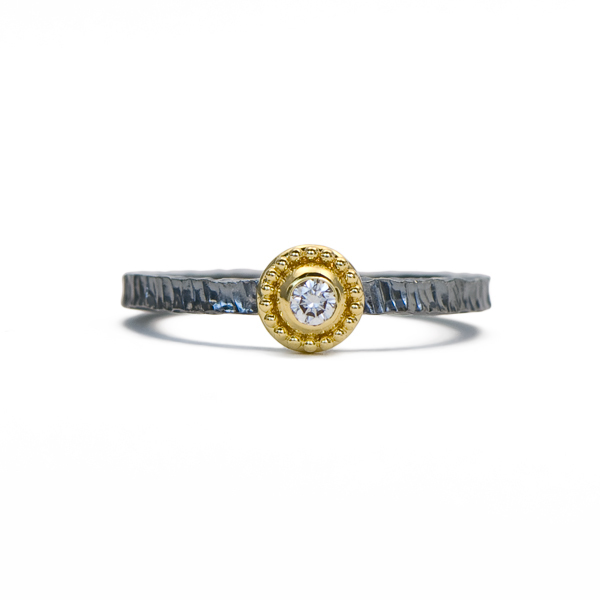 Ring is set with two Diamonds (.08tcw) in 22kt yellow gold granules, spaced for nesting with other bands, on a forged and oxidized sterling silver band, 2mm wide. 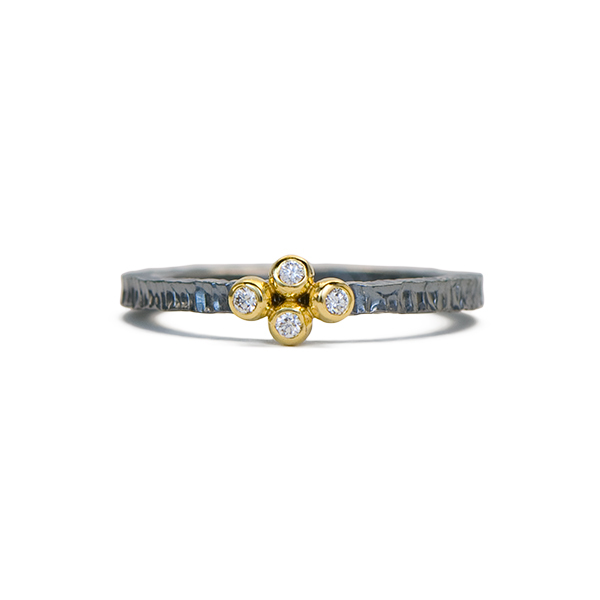 Ring is set with three Diamonds (.10tcw) in 22kt yellow gold granules on a forged and oxidized sterling silver band, 2mm wide. 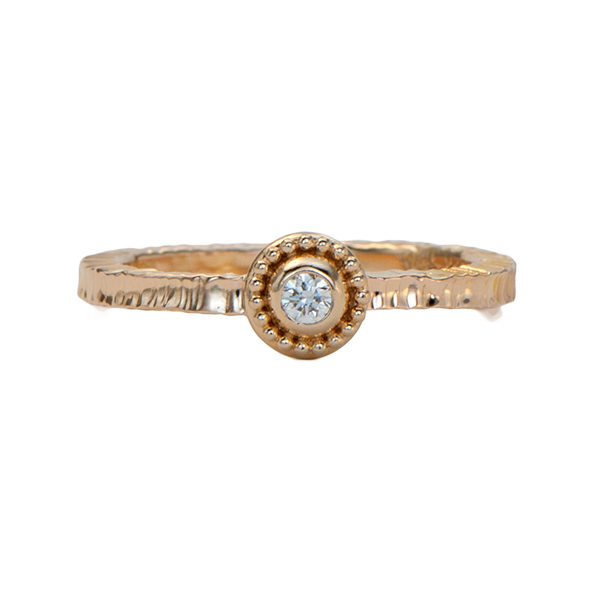 Ring is set with eight Diamonds (.12tcw) in 22kt yellow gold around the edge of a forged 18kt yellow gold band, 2mm wide. 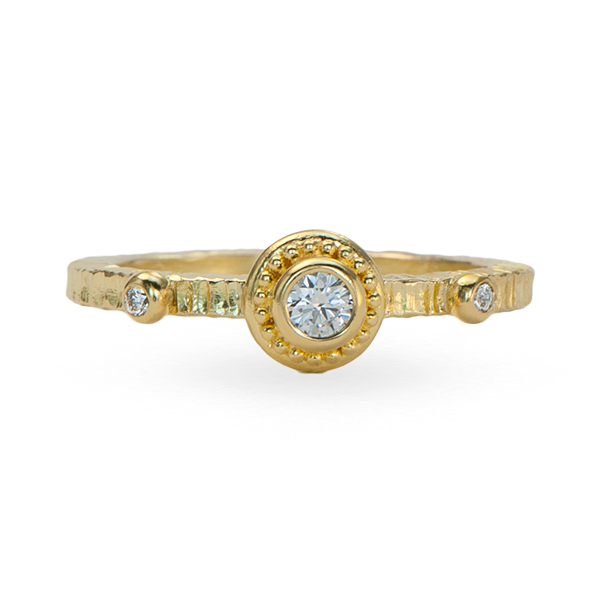 Ring is set with a Diamond (.07cts) in granulated 22kt yellow gold on a forged 18kt yellow gold band, 2mm wide. 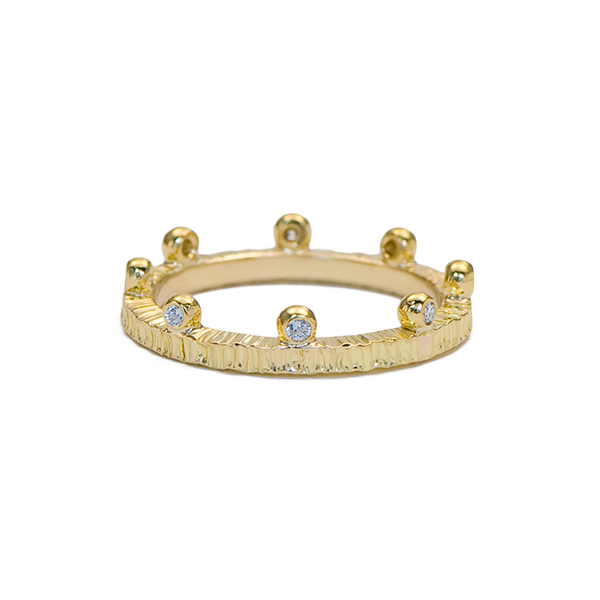 Ring is set with eight alternating sized Diamonds (.46tcw) on edge in 22kt yellow gold on a forged 18kt yellow gold band, 2mm wide. 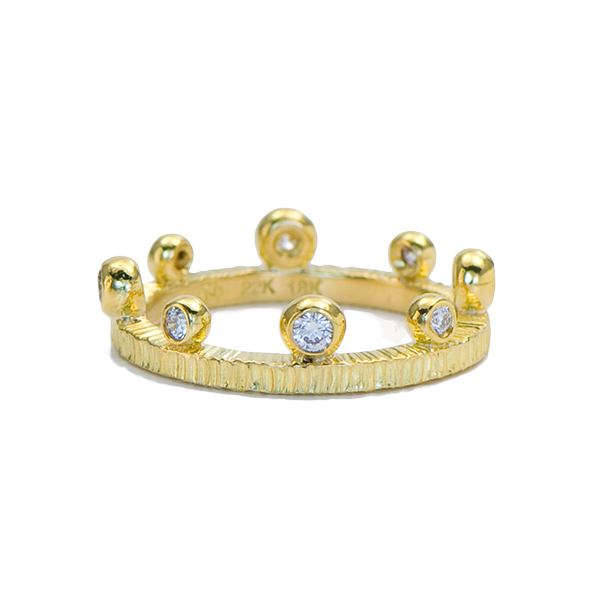 Ring is set with Diamonds (.12tcw) in 22kt yellow gold on a forged 18k yellow gold band, 2mm wide. 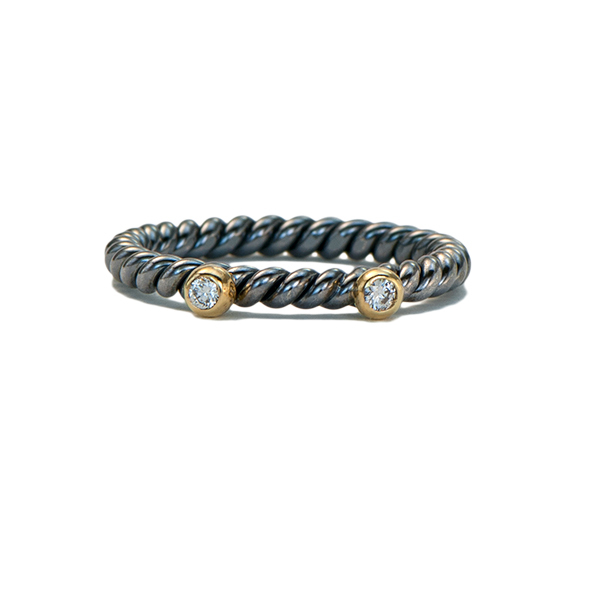 Ring is set with two Diamonds (.08tcw) in 22kt yellow gold on an oxidized sterling silver twist band, 2.5 mm wide. 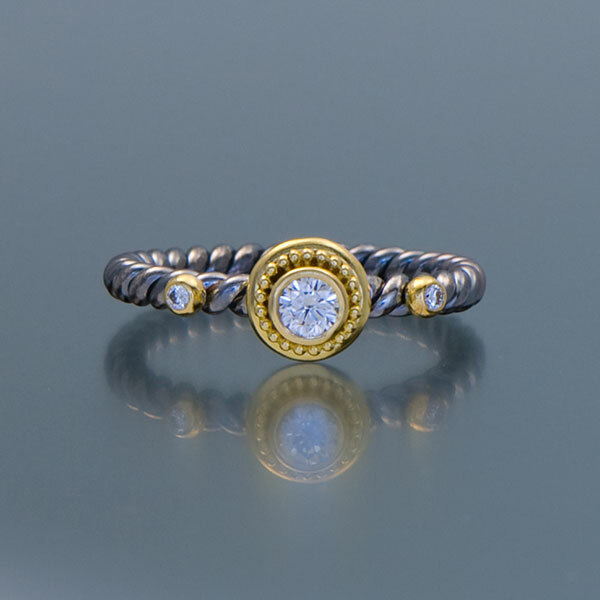 Ring is set with a Diamond (.07cts) in granulated 22kt yellow gold on an oxidized sterling silver twist band, 2.5 mm wide. 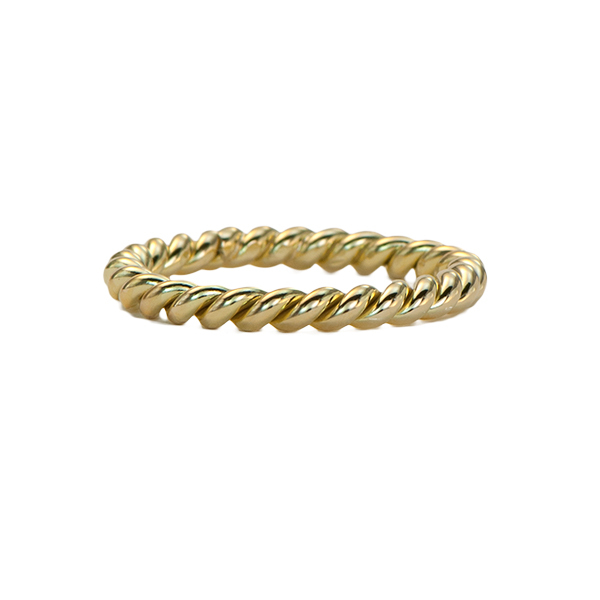 Ring is a plain twist band in 22kt yellow gold, 2.5mm diameter. 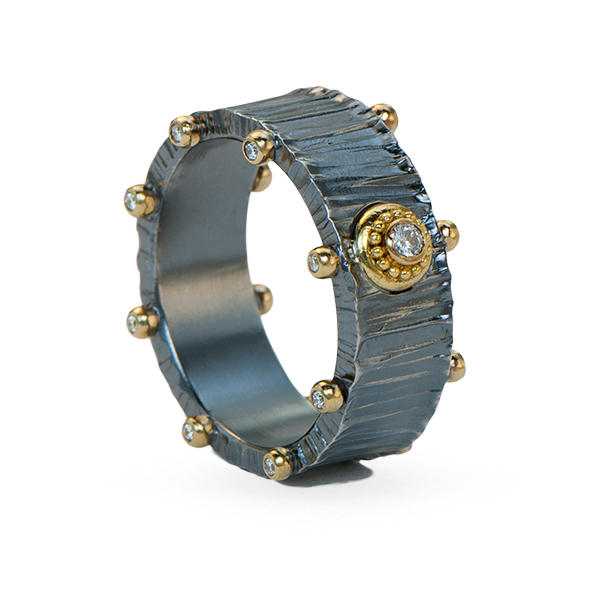 Band is in textured and oxidized sterling silver with four 22kt yellow gold inlay sections. 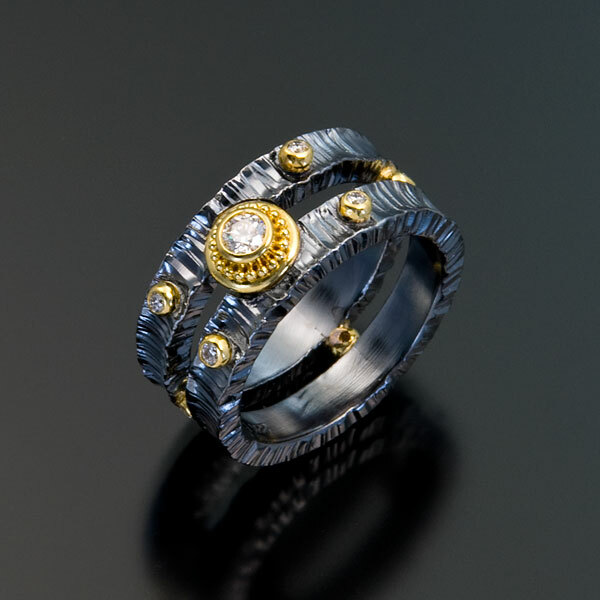 Ring is set with Diamonds (.06tcw) in 22kt yellow gold granules on an oxidized sterling silver twist band, 2.5mm wide. 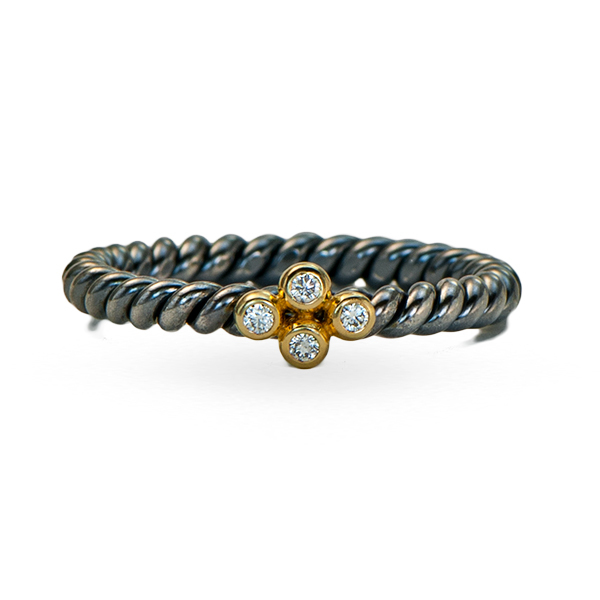 Band is in forged and oxidized sterling silver with 22kt yellow gold granule details, 4mm wide. 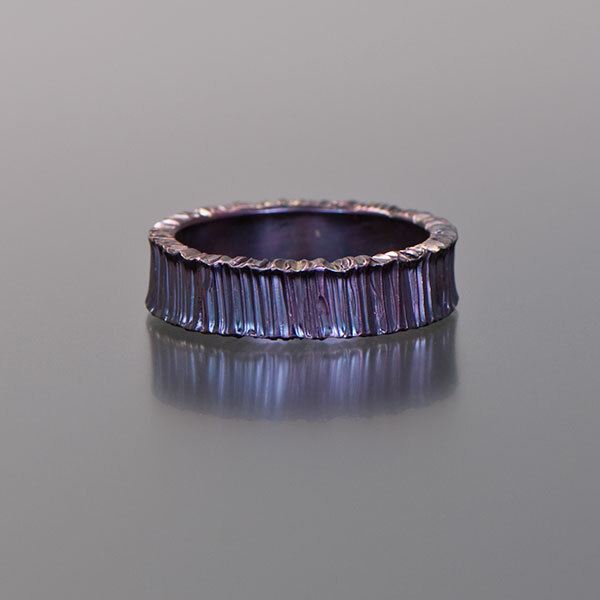 Forged sterling silver plain band, 6mm wide, with our Orchid purple patina. 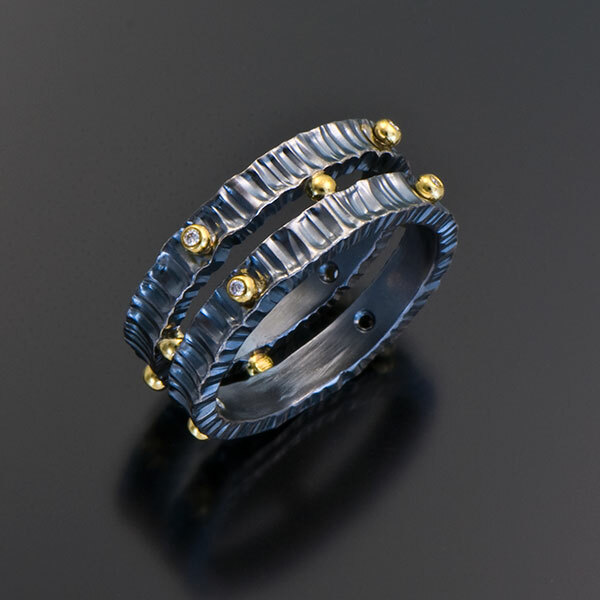 Ring is set with Diamonds (.06tcw) in 22kt yellow gold granules on a forged and oxidized sterling silver band, 2mm wide. 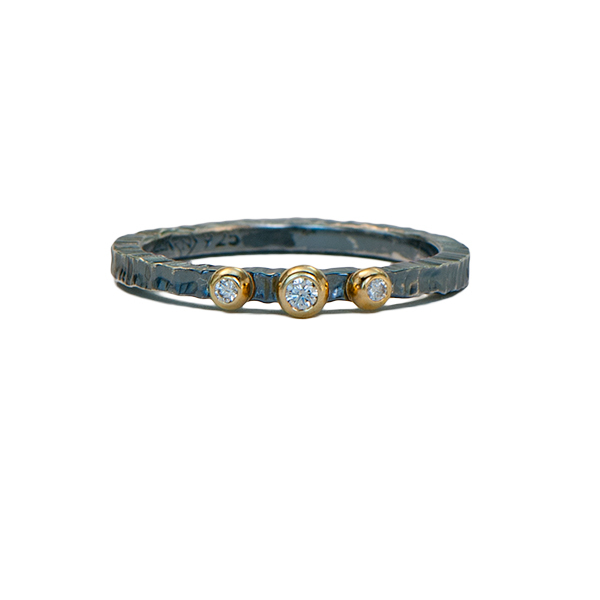 Ring is set with Diamonds (.20tcw) in granulated 22kt yellow gold on an oxidized twist band, 2.5mm wide. 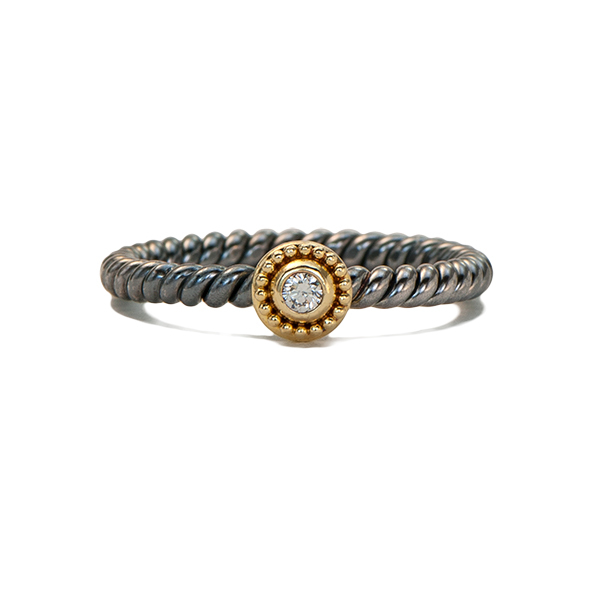 Ring is set with Diamonds (.10tcw) in 22kt yellow gold granules on an oxidized sterling silver twist band, 2.5mm wide. 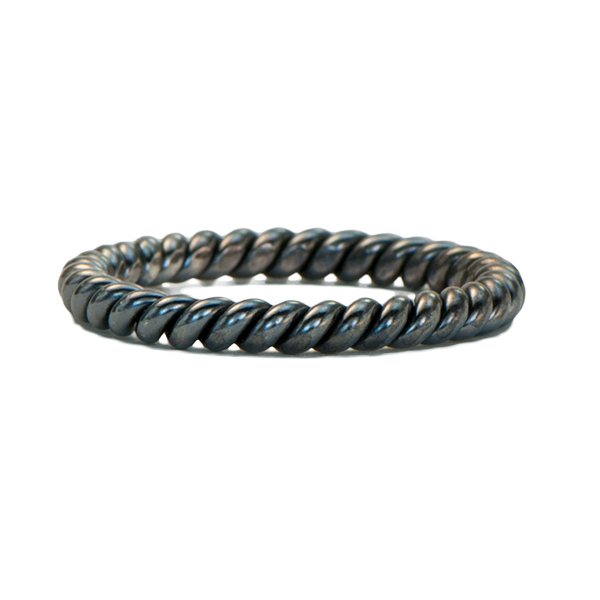 Plain twist band in oxidized sterling silver, 2.5mm wide. Ring is set with a Diamond (.07cts) in granulated 22kt rose gold on a forged 18kt rose gold band, 2mm wide. 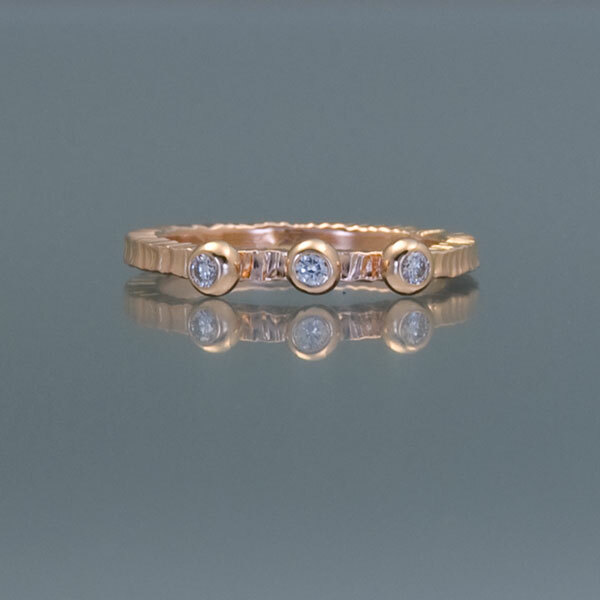 Ring is set with three Diamonds (.12tcw) in 22kt rose gold on an 18kt rose gold forged band, 2mm wide. 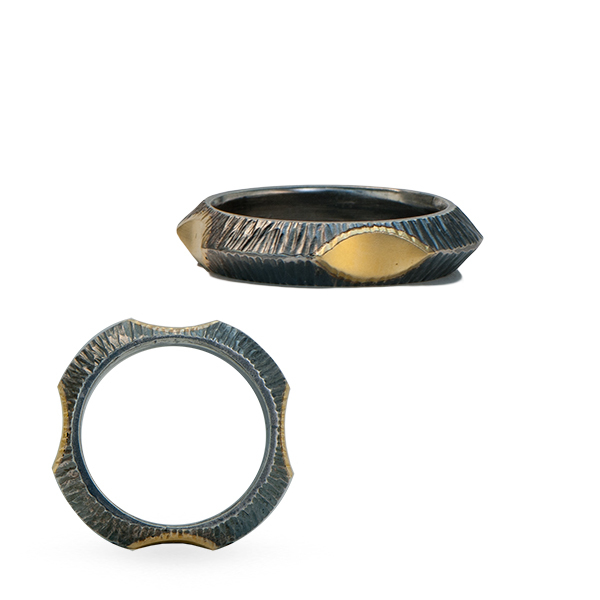 Ring is forged 18kt rose gold, 2mm wide. 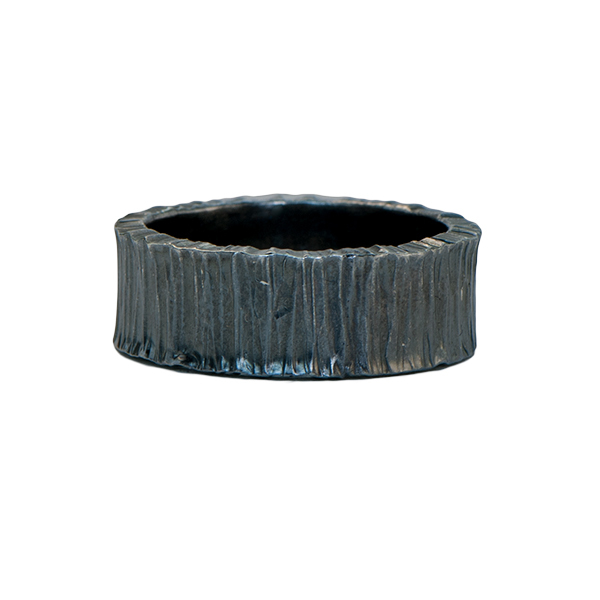 Ring is in forged and oxidized sterling silver, 2mm wide. 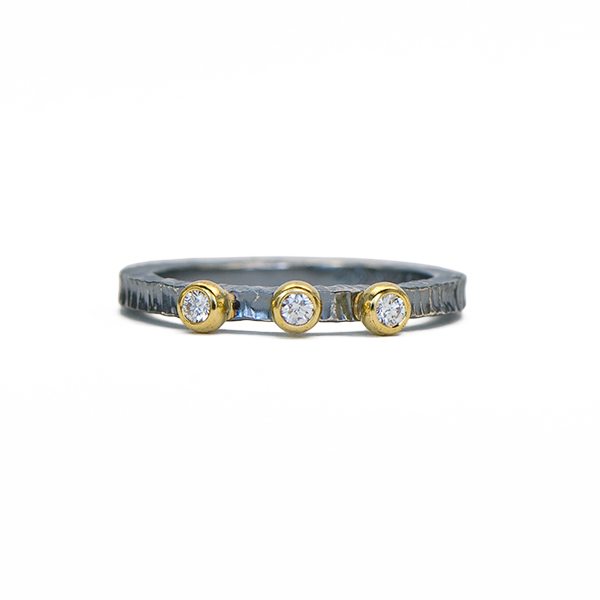 Ring is set with Diamonds (.14tcw) in granulated 22kt yellow gold on a forged and oxidized sterling silver band, 2mm wide. 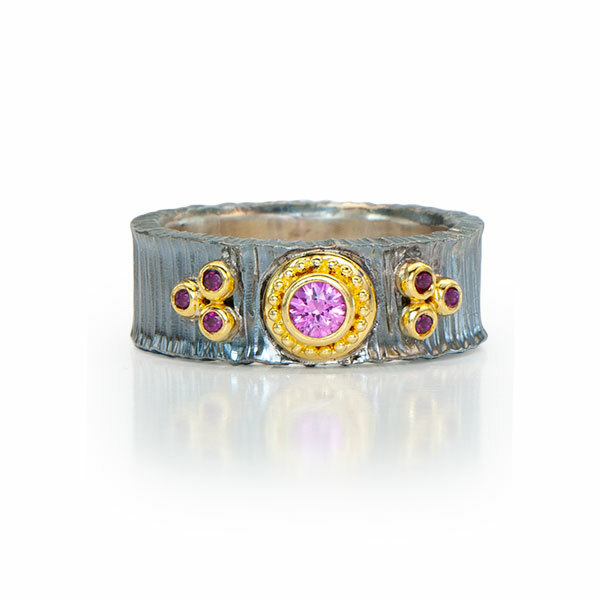 Ring is set with a Pink Sapphire (.13cts) and Diamonds (.09tcw) in granulated 22kt yellow gold on a forged and oxidized sterling silver band, 8mm wide. 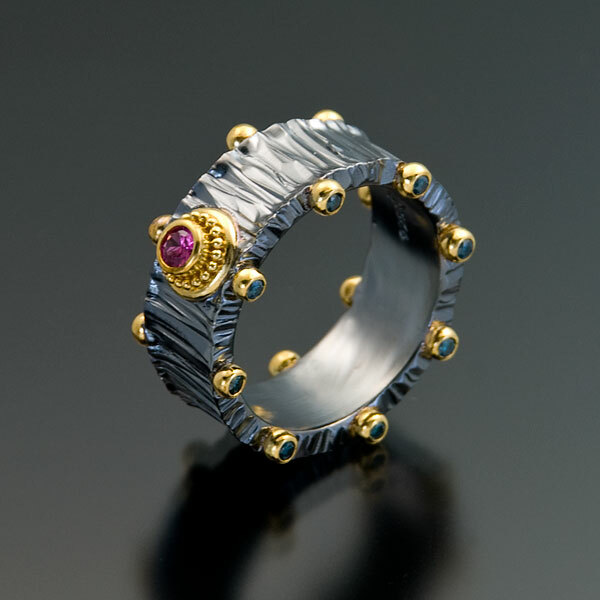 Ring is set with a Red Spinel (.13cts) in granulated 22kt yellow gold on a forged and oxidized sterling silver band, 8mm wide. 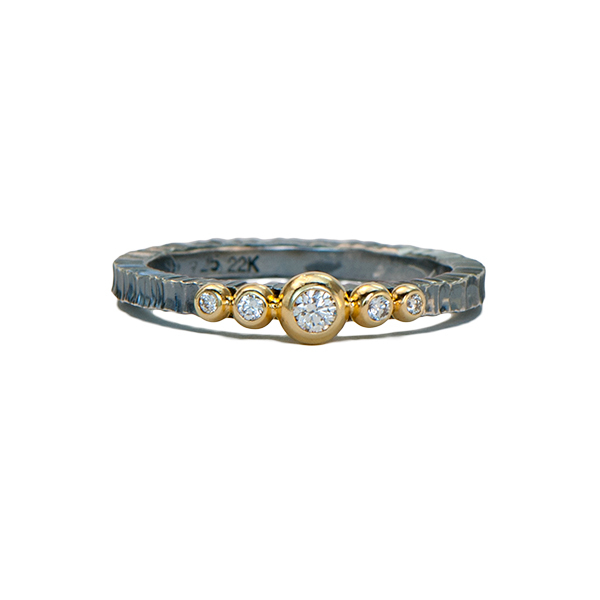 Ring is set with Diamonds (.14tcw) in granulated 22kt yellow gold on an 18kt yellow gold forged band, 2mm wide. 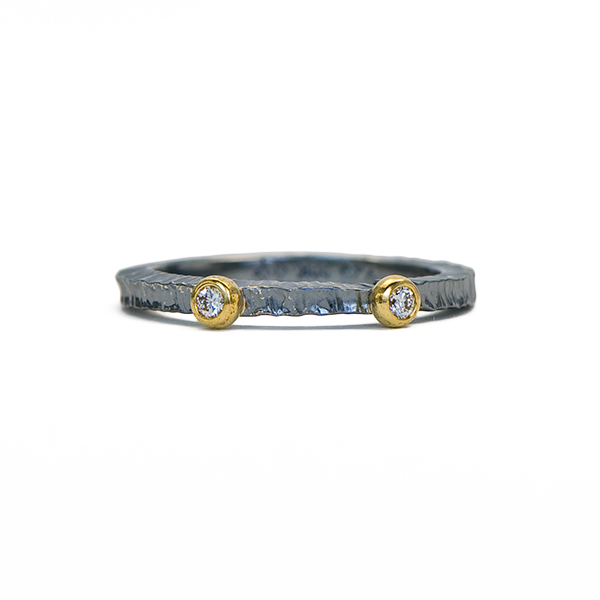 Ring is set with a Diamond (.07cts) in granulated 22kt yellow gold on a forged and oxidized sterling silver band, 2mm wide. 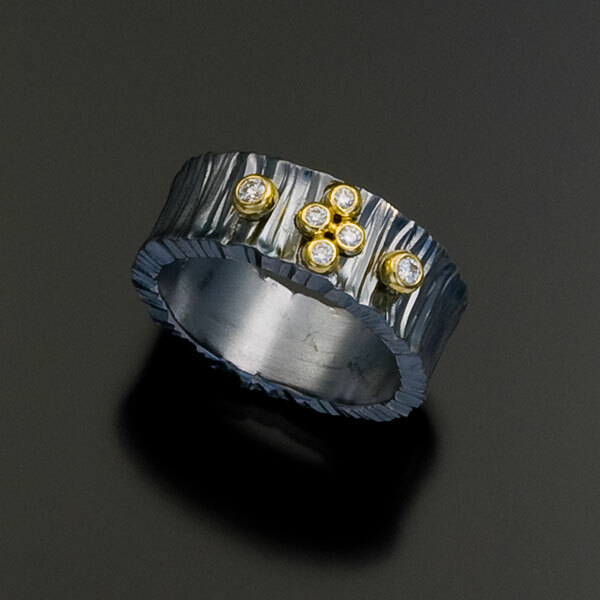 Ring is set with 3 Diamonds (.07tcw) in 22kt yellow gold granules on a forged and oxidized sterling silver band, 2mm wide. 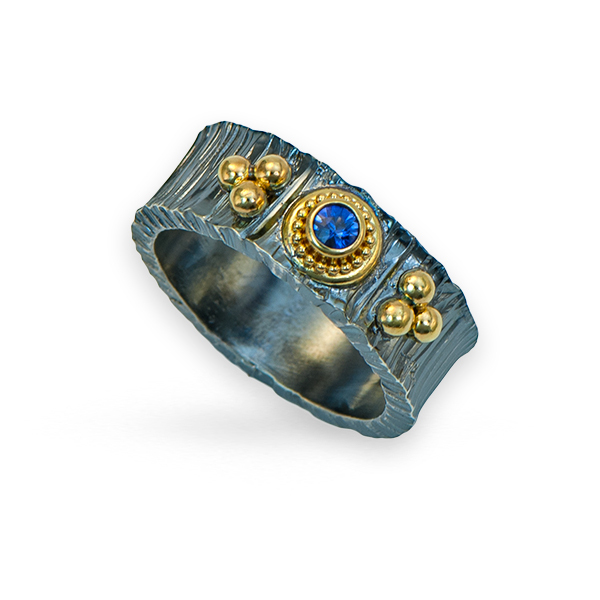 Ring is set with 5 Diamonds (.12tcw) in 22ky yellow gold granules on a forged and oxidized sterling silver band. 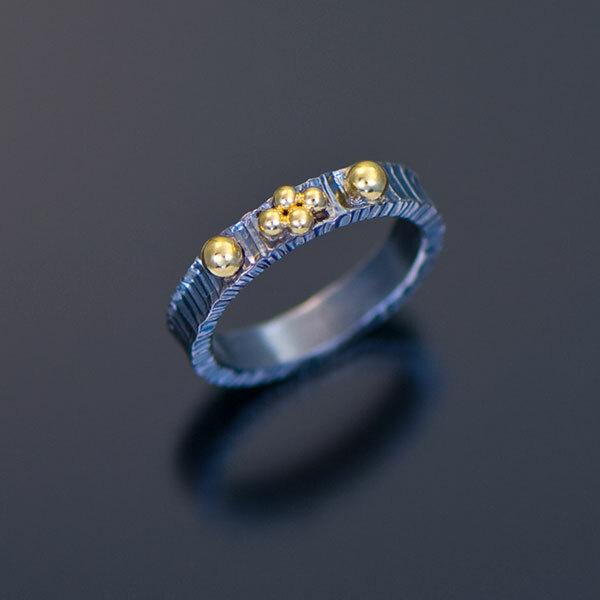 Ring is set with 3 Diamonds (.12tcw) in 22kt yellow gold granules on a forged and oxidized sterling silver band, 2mm wide. 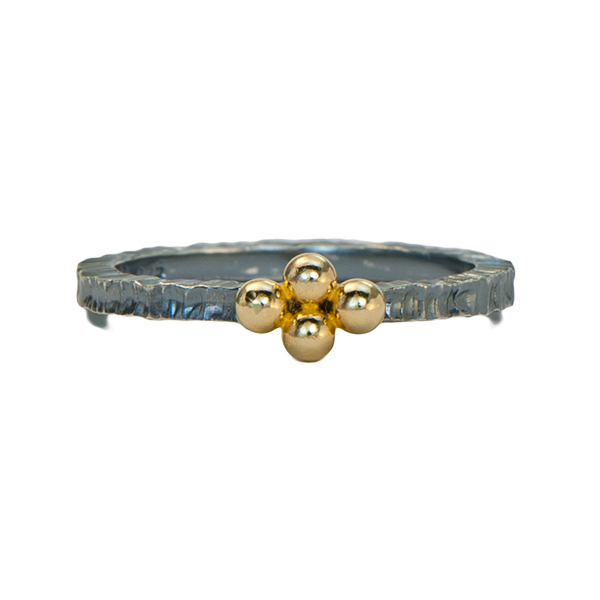 Ring has a cluster of 22kt yellow gold granules on a forged and oxidized sterling silver band, 2mm wide. Band is forged and blackened sterling silver with 22kt yellow gold granules set with a Diamond (.06cts) and Red Spinels (.08tcw). Band is 8mm wide. 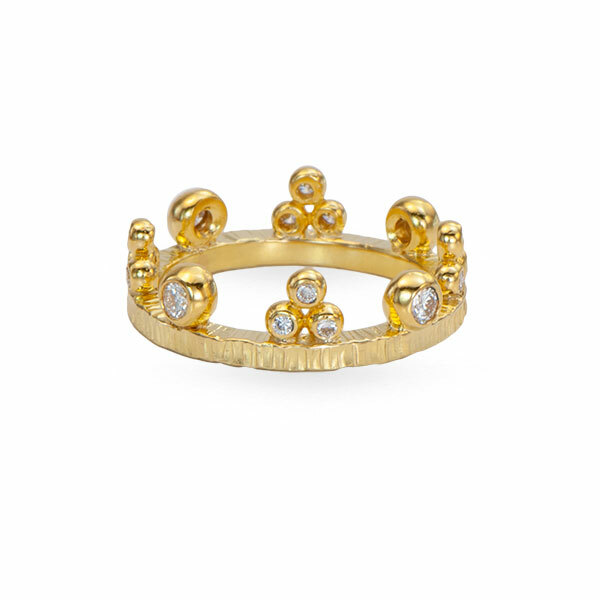 Ring is a 6mm wide forged and oxidized sterling silver band with alternating 22kt yellow gold granule stud and quatrefoil detail. 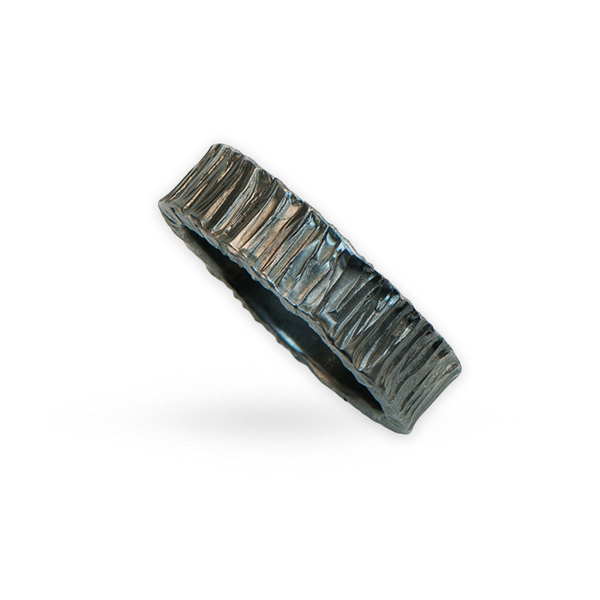 Ring is an 8mm wide forged and oxidized sterling silver band. 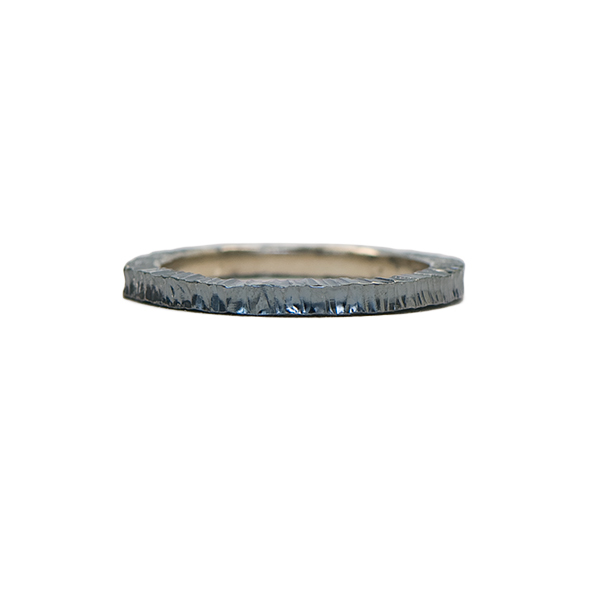 Ring is a 6mm wide forged and oxidized sterling silver band. 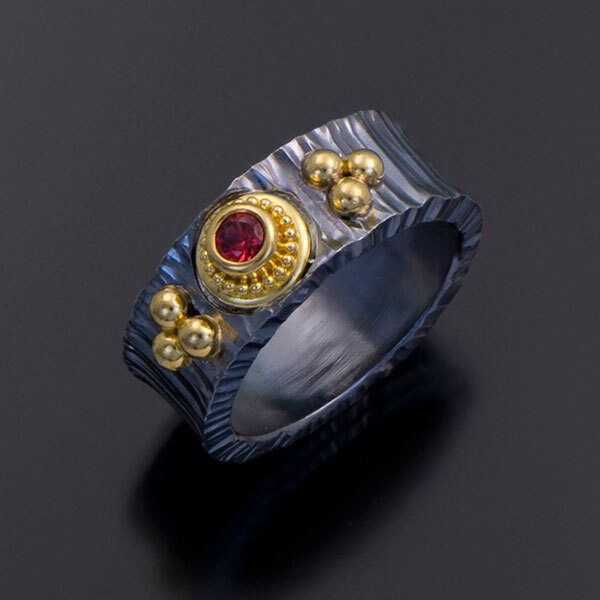 Band is forged and blackened sterling silver with 22kt yellow gold granules set with Red Spinels (.16tcw). Band is 8mm wide. 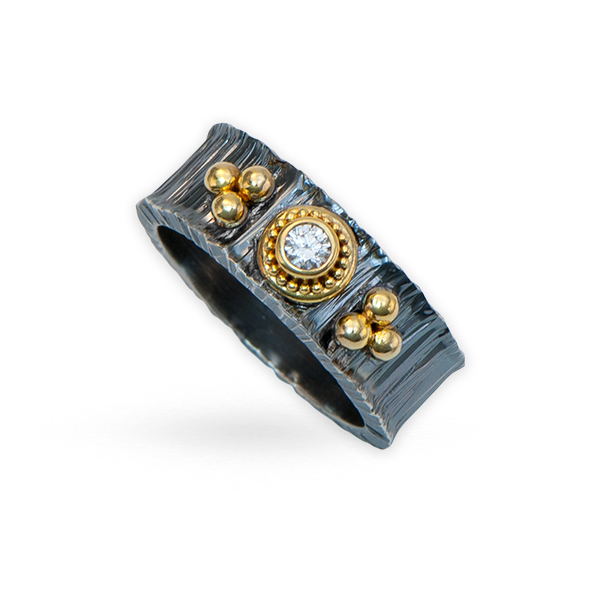 Band is hand fabricated in forged and oxidized sterling silver and accented with 10, 1.25mm 22kt yellow gold balls, band is 2mm wide. 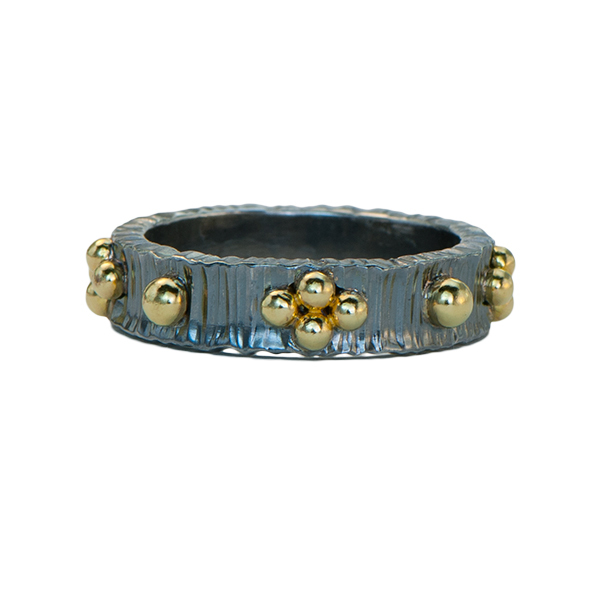 Band is forged and oxidized sterling silver accented with 8 22kt yellow gold balls, band is 4mm wide. 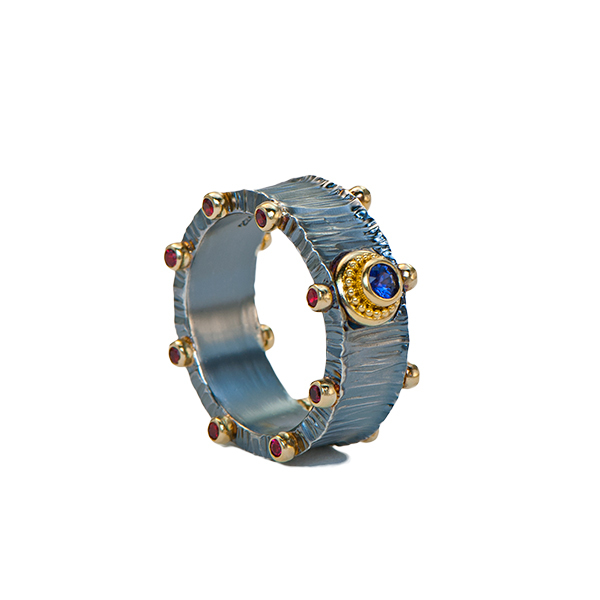 Ring is set with a Pink Sapphire (.12cts) and Blue Diamonds (HTHP, .24tcw) in granulated 22kt yellow gold on a forged and oxidized sterling silver band, 8mm wide. 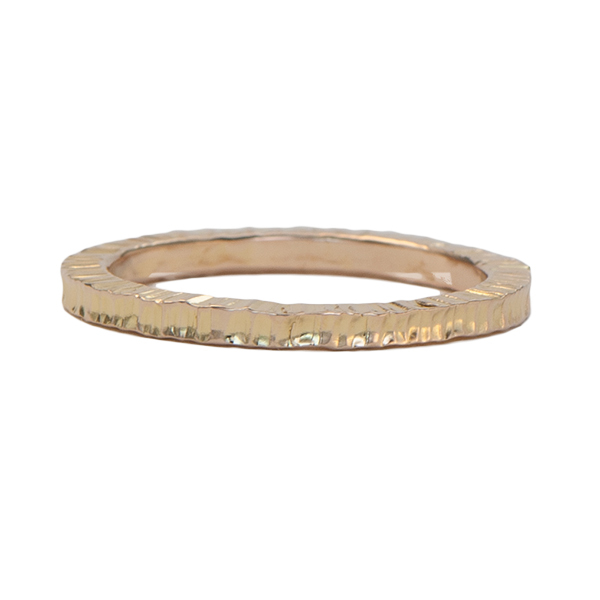 Bamboo textured plain band in 18kt yellow gold, 2mm wide. 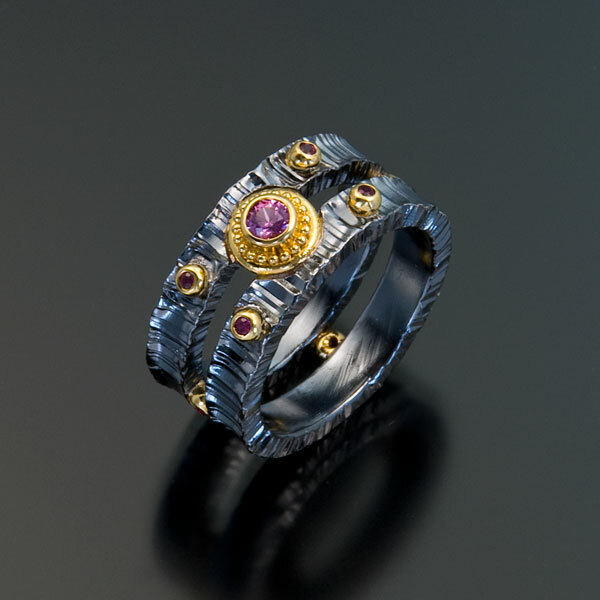 Ring is set with a Purple Sapphire (.12cts) and Red Spinels (.24tcw) in granulated 22kt yellow gold with a forged and oxidized sterling silver band, 8mm wide. 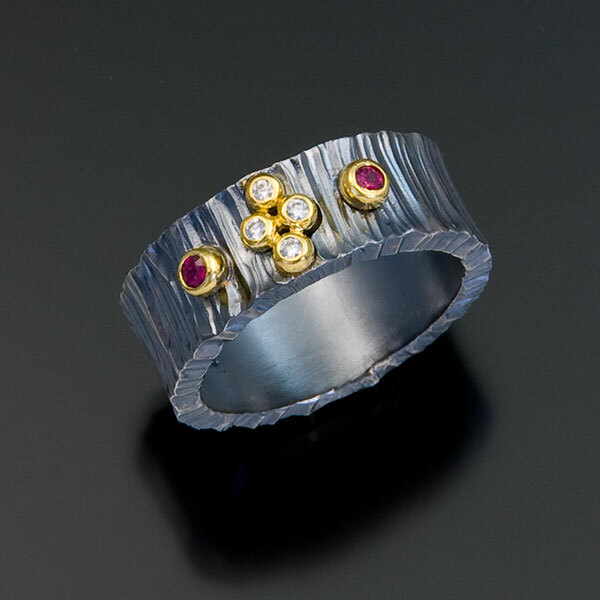 Ring is set with Diamonds (.20tcw) in granulated 22kt yellow gold with a forged and oxidized sterling silver band, 3/8″ W.
Ring is set with a Pink Sapphire (.14cts) and Rubies (.08tcw) in granulated 22kt yellow gold with a forged and oxidized sterling silver band, 3/8″ W.
Ring is set with a Blue Sapphire (3mm, .13cts) in granulated 22kt yellow gold with a forged and oxidized sterling silver band, 8mm wide. 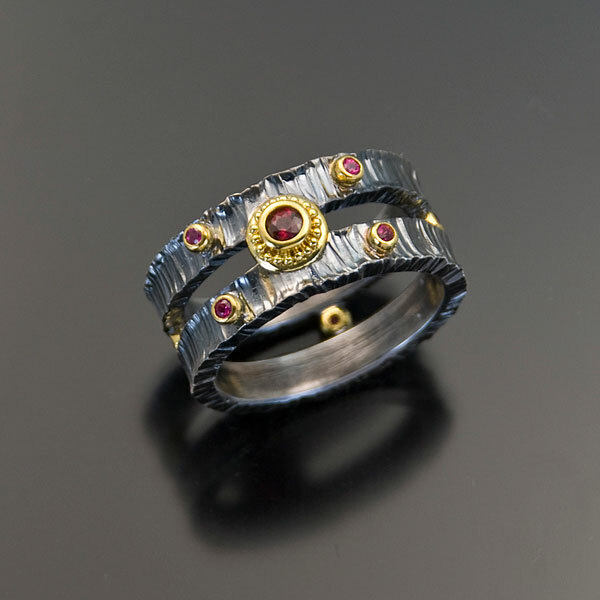 Ring is set with a Red Spinel (3mm, .13cts) and Diamonds (1.5mm, .09tcw) in granulated 22kt yellow gold with a forged and oxidized sterling silver band, 8mm wide. 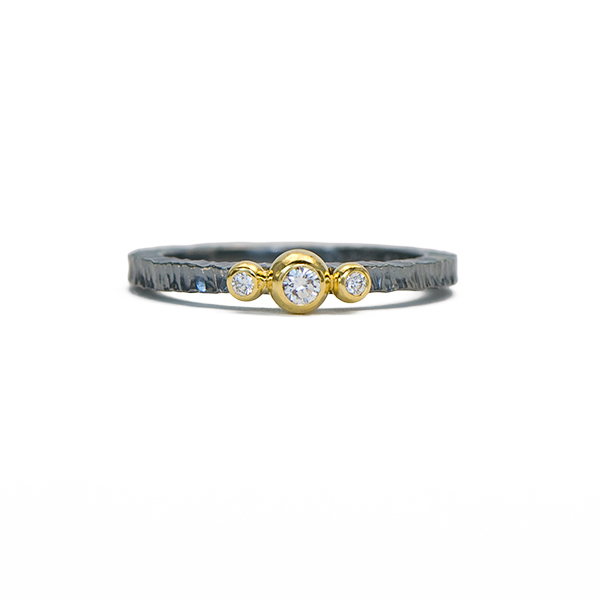 Ring is set with a Diamond (3mm, .11cts) in granulated 22kt yellow gold with a forged and oxidized sterling silver band, 8mm wide. 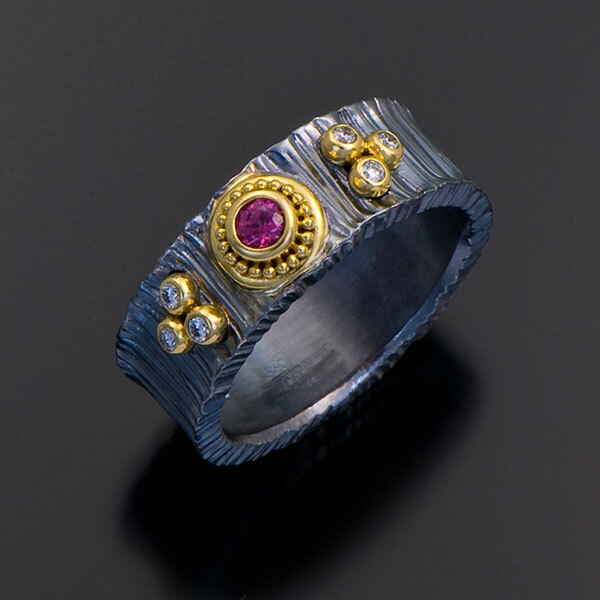 Ring is set with a Ruby (.14cts) and Magenta Sapphires (.14tcw) in granulated 22kt yellow gold on a forged and oxdized sterling silver double band, .375″ W.
Ring is set with Diamonds (.08tcw) in 22kt yellow gold on a hand forged and oxidized sterling silver double band, band is 10mm wide. 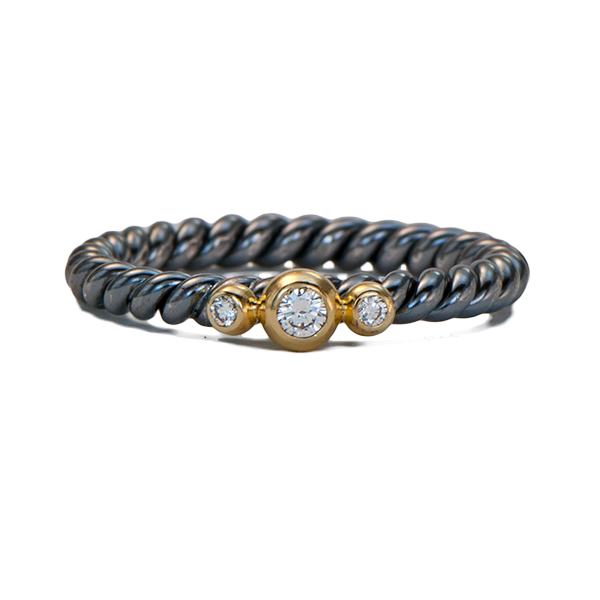 Band is forged and blackened sterling silver with 22kt yellow gold granules set with Diamonds (.14tcw). Band is 8mm wide. 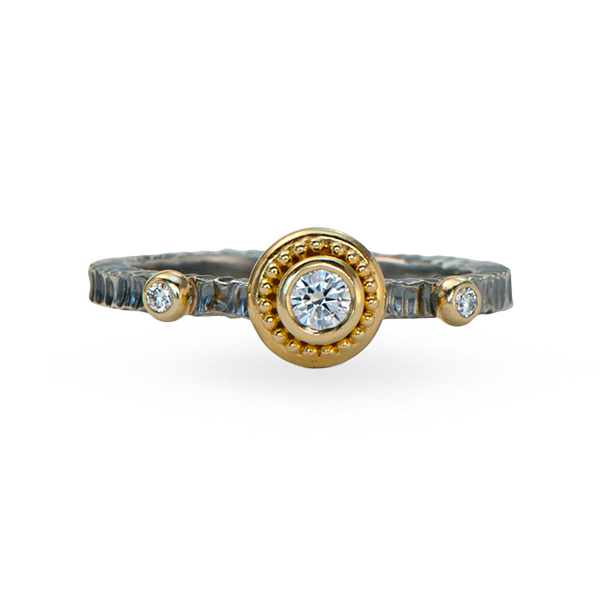 Ring is set with Diamonds (.22tcw, one in the center of the band and on the ends of each of the 16 small granules) in granulated 22kt yellow gold on a hand forged and oxidzed sterling silver band, 8mm wide.